Chicken Meal, Peas, Sweet Potatoes, Chicken Fat (Preserved With Mixed Tocopherols), Pea Protein, Potato Protein, Roasted Venison, Smoked Salmon, Natural ¬Flavor, Ocean Fish Meal, DL-Methionine, Potassium Chloride, Taurine, Choline Chloride, Dried Chicory Root, Tomatoes, Blueberries, Raspberries, Yucca Schidigera Extract, Dried Lactobacillus Plantarum Fermentation Product, Dried Bacillus Subtilis Fermentaion Product, Dried Lactobacillus Acidophilus Fermentation Product, Dried Enterococcus Faecium Fermentation Product, Dried Bifidobacterium Animalis Fermentation Product, Zinc Proteinate, Vitamin E Supplement, Niacin, Manganese Proteinate, Copper Proteinate, Zinc Sulfate, Manganese Sulfate, Copper Sulfate, Thiamine Mononitrate (Vitamin B1), Vitamin A Supplement, Biotin, Potassium Iodide, Calcium Pantothenate, Ribo¬flavin (Vitamin B2), Pyridoxine Hydrochloride (Vitamin B6), Vitamin B12 Supplement, Manganous Oxide, Sodium Selenite, Vitamin D Supplement, Folic Acid. Contains A Source Of Live (Viable), Naturally Occurring Microorganisms. When changing to Taste of the Wild, we recommend making a gradual transition over 7 - 10 days to help avoid possible digestive upset in sensitive pets. Add a small amount of new food to your cat’s previous diet, gradually increasing the new and decreasing the previous diet until the transition is complete. They might not be cheetahs or lions, but today's domestic cats share the same ancestral cravings. To satisfy these instinctual appetites, Taste of the Wild wet and dry formulas are made with real, roasted meat plus fruits, vegetables and legumes that are chosen for their specific health benefits. Taste of the Wild is made with premium fish and meats like smoked salmon, trout, ocean fish, roasted venison and chicken. Every formula is grain-free and provides lasting energy with complex carbs from sweet potatoes and legumes. These highly digestible proteins and fiber-rich carbohydrates will keep your pet feeling full and energized throughout the day. Since 70% of your pet's immune system is found in the gut, it makes sense to choose a food that's good for the digestive tract. 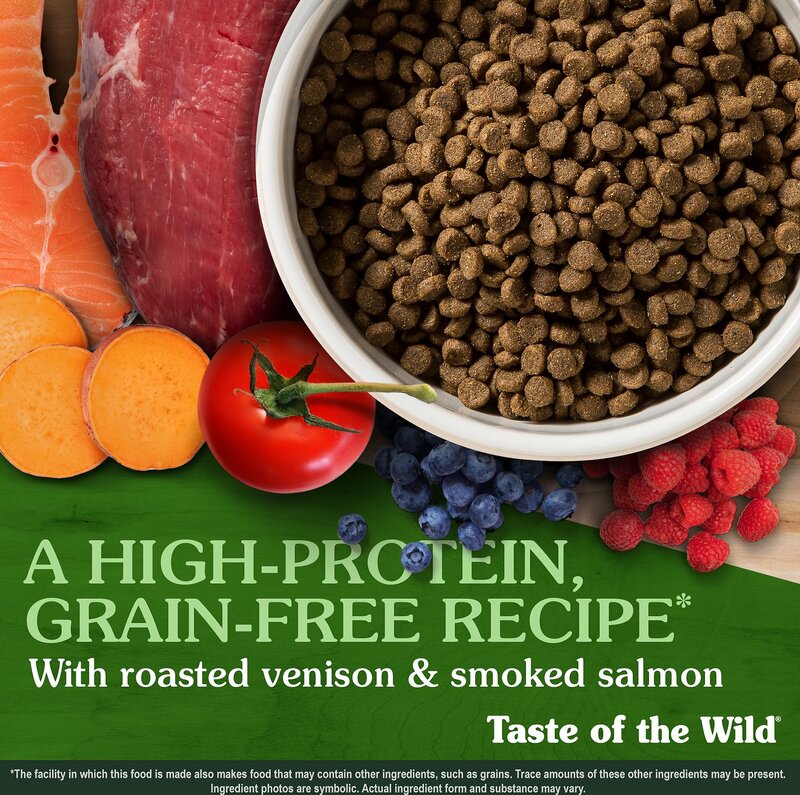 Taste of the Wild includes prebiotics and species-specific probiotics with bacteria that's naturally found in a cat's GI tract. The proprietary Viables probiotics are added after the kibble is cooked so your cat gets guaranteed live, active cultures that support healthy digestion. 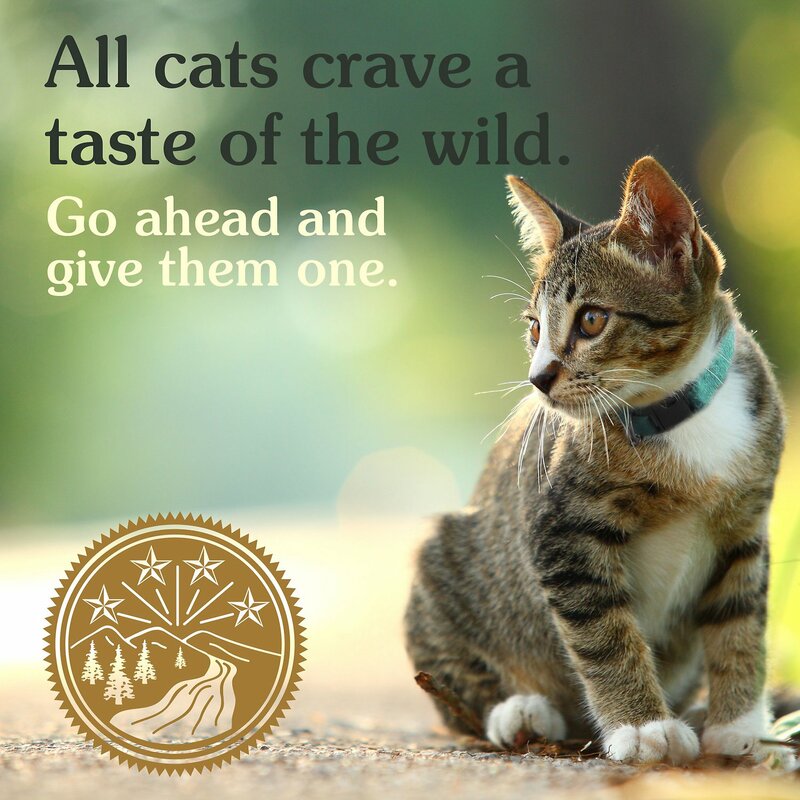 To help your pet's body absorb all of the beneficial minerals in her food, Taste of the Wild recipes have chelated minerals. That means they can easily attach to proteins for absorption during digestion. So your kitty will enjoy the full value of every carefully selected mineral that these foods have to offer. 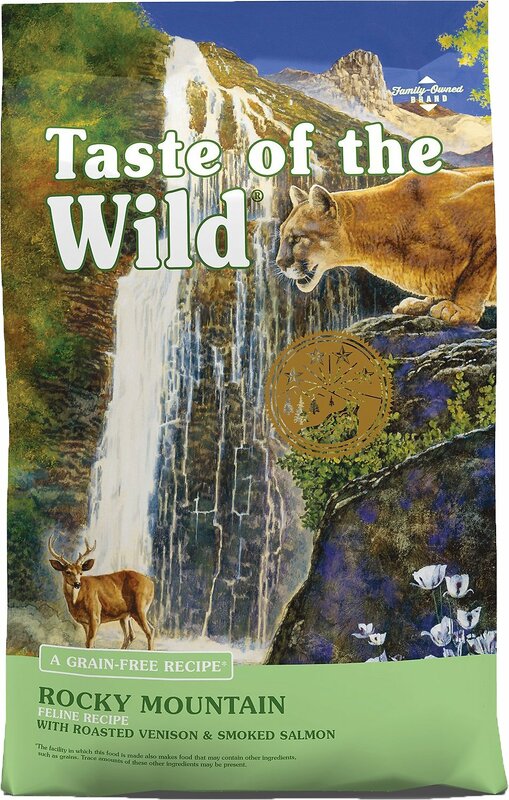 Taste of the Wild gives your little wildcat just the right dose of omega fatty acids in every bite. Marine-sourced omega-3 comes from smoked salmon or ocean fish, or a combination of these ingredients. Omega-6 from plant sources balance out the omega-3s, and they work together to help maintain your pet's skin and coat health and to support overall wellness. Better - Too much sugar in many brands I've had. My cat is a healthy young female and thank god isn't a finicky eater like so many cats. I've switched to this (plus a small amount of wet food) over a few weeks and she's loving it. Her coat is glossier than ever and she is still finding interest in everything that goes on. Of course it's important to keep her favorite drinking-glass topped up with fresh water (! she absolutely won't drink from a bowl!) but I'm very happy with the change and think she is too. First thank.you Chewy for your fast delivery and great service Was totally out and needed in a hurry. Out of 6 cats this is the only food they will eat. I prefer they only eat wet food but cats are well known for their finicky eating. The other 4 eat this dry food and elegant medleys wet. Will be ordering again from you. So, one negative is that the cats do not like this nearly as much as the product I had been feeding them (which was 4x more expensive). That is also a positive, since the older cat was putting on a lot of weight with the previous product. I think this product is good value for the price. My cats switched to this from Fancy Feast. The vomiting stopped immediately and hasn't happened since. They love the taste of this food. They seem to be eating less but enjoying it more. Plus, it's much healthier for them. I definitely recommend this food! I've used Blue buffalo kitten food for the past year and a half but wanted to finally switch over to adult food since the kittens are almost a year now (mama cat is almost 2 - and fixed now). 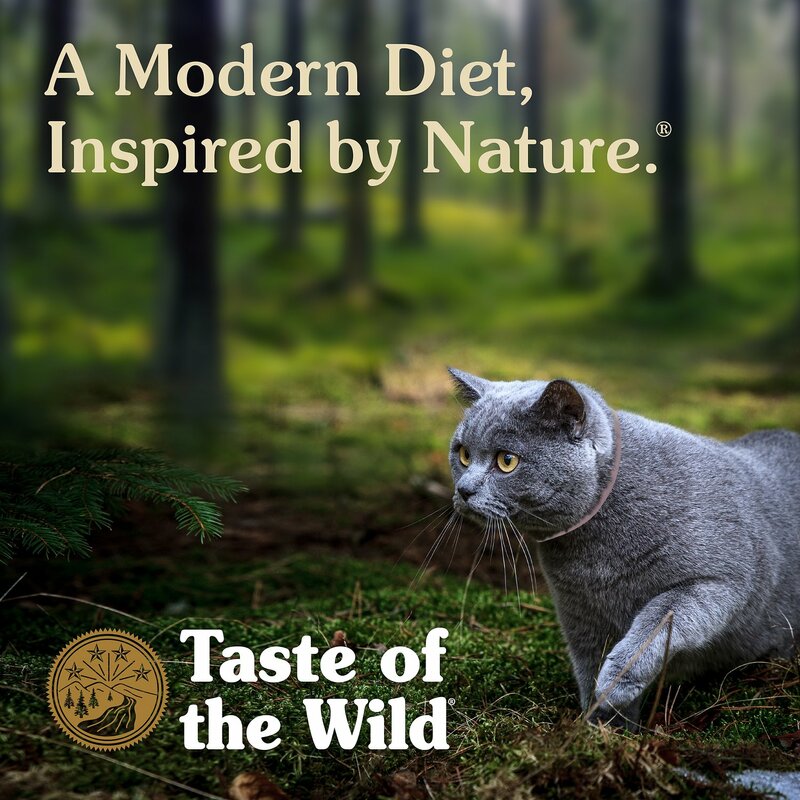 I goggled what is the best dry cat food and taste of the wild was one of the tips, so I decided to give it a shot and I am so thankful my 6 cats love it!! I am so glad I bought this food based on reading reviews. I have 1 cat and 1 kitten with food sensitivities, and I have bought numerous grain-free options. They just didn’t like it. The minute I put this in their food dishes they were eating. I am very pleased they like it and it is so good for them; suitable for both cats and kittens. I highly recommend. I love that this is a family owned brand! I have a kitty cat that has food sensitivities so it’s important I provide wholesome nutrition without any additives that can irritate her stomach.